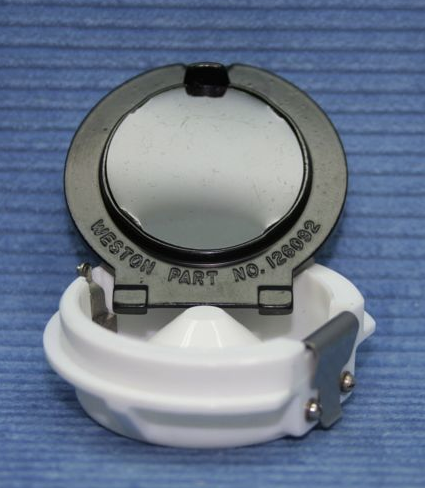 This little chunk of white plastic which doesn't quite seem to fit is in fact an extrordinary piece of design which has made the Weston the most accurate incident light meter in the world. The inverted cone shape is designed so that as the meter is angled to the light source, the readings remain accurate which they would not do if it were a dome. And because backlight effects the exposure, a small part of the invercone sticks-out beyond the top of the meter case to pick any such light up. Inspired design or lucky chance - your decision! Only problem is that you can't see the dial if you hold the meter with the invercone towards you as you would do if the light is coming from behind you - which it often does. 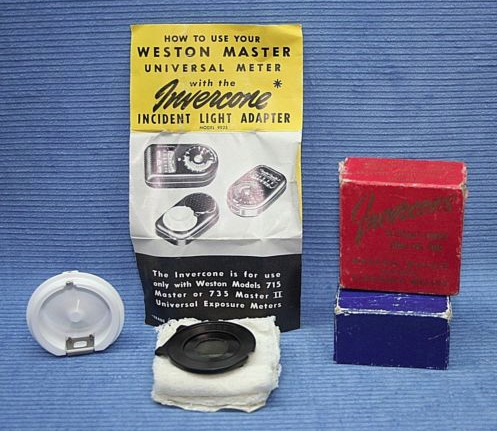 The first meter to use an invercone is believed to be the Weston II. The top picture shows a Weston IV with it's original invercone which by then had become a more bulbous affair. The next picture down shows original model that came complete with a nutral density filter that was needed as the baffle could not be closed with it on. A similar invercone but without the "star" shape was made for the Master IV and later models. 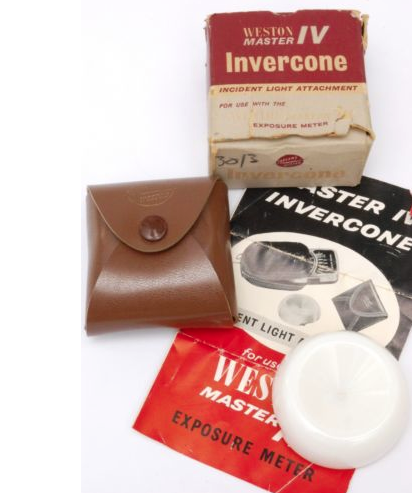 It seems that the first commercial incident light meter was the Avo-Smethurst incident meter: This meter used a flat diffuser over the normal light-sensitive cell. This was fairly successful in front-lit situations but poor at other lighting angles. In the US, the Norwood Director exposure meter (later known as the Brockway and eventually as the Sekonic) was an early and successful attempt to solve both motion picture needs and side-lighting problems. This meter was held in wide regard and used by most professional cinematograhers. 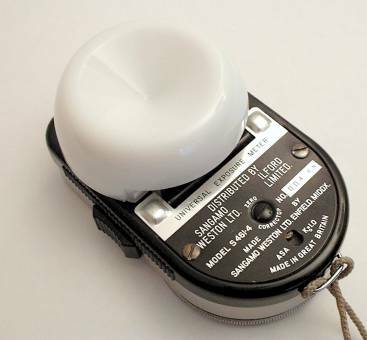 The Norwood was designed for incident light measurement and used a translucent hemisphere over the meter receptor cell. The hemisphere is actually a three-dimensional model of 'real world' objects, light reaching the inside of which is used to estimate exposure. The performance of the hemisphere is said to be 'compensating' because it integrates light received from a multitude of directions associated with both the main light and fill-in sources. The Brockway and it's later variants also came with a flat diffuser for incident readings.Exposure estimation was particularly difficult in back-lit situations even with this otherwise excellent meter. Meanwhile, back in the UK, in 1957 it was shown that in theory a better exposure reading could be obtained using back-leak compensation (BLC) and a Mr D Connelly, of Sangamo Weston, brought it to reality. The earlier invercones were much flatter devices than the later ones and therefor less effective.